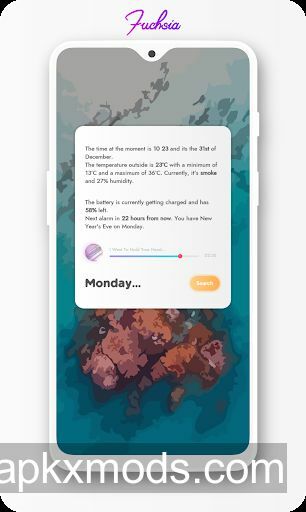 Overview: This app requires KWGT and KWGT PRO in order for the widgets to work! Please do not rate it low if you don’t have KWGT PRO! • Fuchsia is a collection of Gradient based widgets focused on elevating your homescreen experience! • Each widget in Fuchsia has at least one element(text, shape etc.) based in gradient to give your homescreen an awesome look! • Almost all widgets have been converted into komponents so that you can change the text color very easily depending on your wallpaper. • Every widget is set perfectly at 100% scaling and it is recommended to keep the scaling at 100% for best results! • Widgets include a variety of types like text widgets, search bars, music widgets and shape widgets. Please install and leave a review for the app. Special thanks to Frank Monza for developing KAPK which made this app possible! • Added 5 new widgets! • 95 total premium widgets!